Quantity : 4/PK. 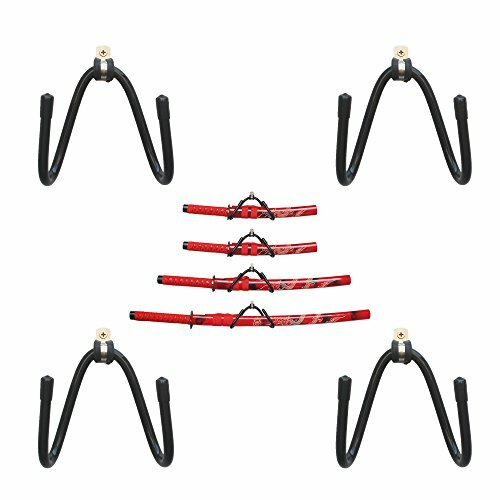 4-racks ,4-R rings,4-screws. No Sword Included. Adjustable - the rack is bendable. You can bend it into any size you like. The biggest opening is 3 inches - 75MM. Suitable for displaying swords, daggers ,axes and small knives. No more than 3 Pounds. 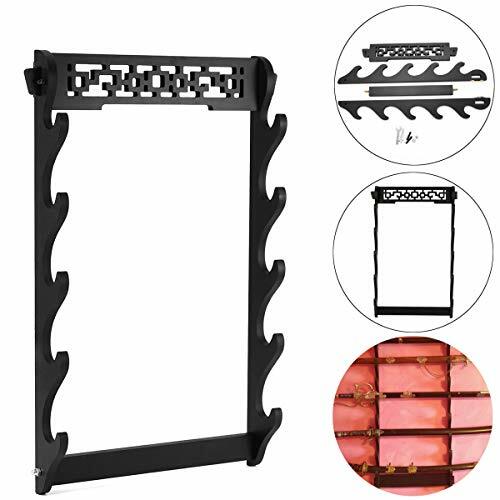 Show off your swords in style with this beautiful Two-Tier Sword Stand in black lacquer finish (model MA-2SD) from Ten Ryu, which displays up to two swords. This stand has a black lacquer finish and red velvet holders and has the Ten Ryu logo on the front in gold. Simple, classic and designed to show off your beautiful collection without distracting from the artistry of the swords. 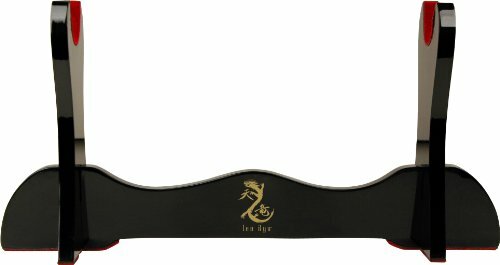 Ten Ryu offers a wide range of affordable Samurai swords, which are hand sharpened to ensure the sharpest blade. Swordsmiths combine modern knowledge and traditional secrets to produce superior quality swords with enhanced durability, sharpness, and exquisite craftsmanship. Quantity :4 pieces. Hold 4 swords. No swords included. Adjustable - The rack is adjustable . You can bend the arms to create more or less space which fits the thickness of your sword, and adjust the width so the rack can grab the sword more securely. R Rings and hardware included. Display your sword on the wall. Scottish Dirk 9'' Overall Length, 3/16" thick. Blade: Double Edged looh but only sharp on one edge. Heavy Weight 440 Stainless Steel Blade. The Sword stand can be assembled in seconds. The Martial Kanji has been painted in gold. The Masahiro MA-1SD is a perfect solution to a Japanese sword collector. 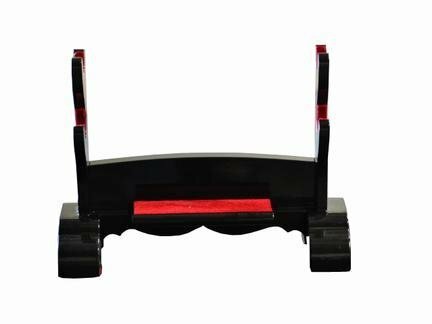 It boast a black glossy lacquer finish and red velvet holder to not only display your prize collectible, but also protects the sword from rough surfaces. Brand: Ten Ryu | Manufacturer: Master Cutlery Inc. Handmade Sword, is a well known and authentic hand-forge sword company. We are professional and specialized in hand-forging Japanese samurai swords. 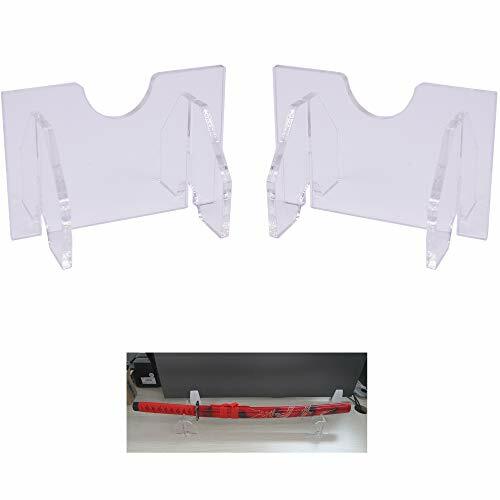 We have a full range of Katana, Wakizashi, Tanto sword and other sword's accessories. Swords from Handmade Sword are all handmade in traditional ways by skilled and experienced swordsmiths. Handmade Sword strives for making the highest quality swords in the past decades. Which makes us one of the best sword sellers in this industry. We believe in keeping customers happy and providing them with the best sword at a competent price. Traditional Forging Method: Heat Tempered or Clay Tempered. Blade: All Handmade Sword s blades are full tang, engraved with signature of sword smith. And it can be fully disassembled and assembled. Most of our functional blades are made of high carbon content steel. Also, there are blades made of stainless steel or aluminum alloy for Iaido training swords. Tsuba and other fittings: Most fittings are made by brass. For Tsubas, we use coper, or brass, or iron, or alloy. It depends on each tsuba. Handle and Saya (Scabbard): Wooden or other specified. Most handles covered by rayskin and Japanese cotton Ito. 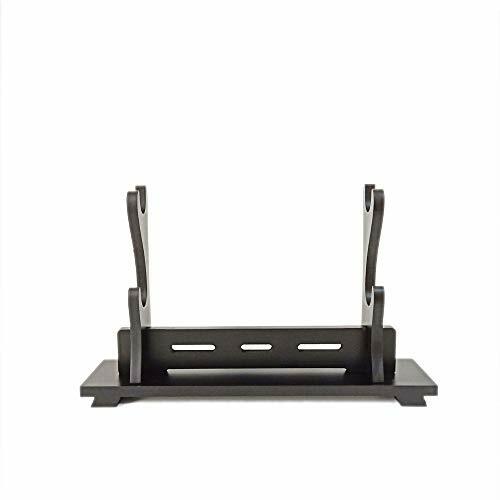 This BladesUSA 8-Tier Wall Mount Sword Stand (model WS-8W) allows you to show off your collection in style. 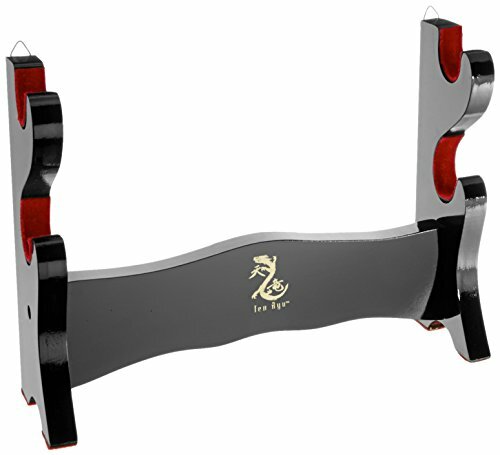 This rack mounts directly to your wall allowing for you to display up to 8 swords in no time at all. Keep your collection visible but out of reach of little ones and free up space from the surfaces of furniture by having your whole collection in one eye-catching place at once. It's made of wood and painted in a flat black that will go with any decor. This Celtic Sword Hanger by Szco Supplies is 3 Inch in overall length. This hanger comes as a set of two. This hanger is adjustable to fit not only swords but daggers, pistols, canes, etc. 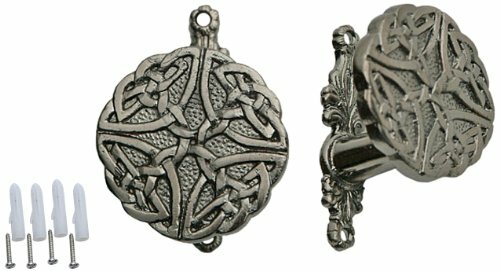 The hanger is made of cast metal with a Celtic design. Brand: SZCO Supplies | Manufacturer: SZCO Supplies, Inc. Quantity :2 pieces. Hold 1 swords. No swords included. Quantity : Two racks (one set) to hold one sword. No sword. Easy to assemble - instruction included. Material - Acrylic . The rack can Show off your sword without being noticed . Horizontally- The sword can be displayed on the desk horizontally , not on the wall. Measurement : 3 INCH (75MM) tall. 5MM Thick Acrylic - very strong. Versatile Usage - Fit most swords, poles, katana, samurai sword, Wakizashi Tanto. All wood pieces are in excellent shape and mounting hardware are spot on. Assembly: Slide the two end pieces on to the main piece. Hang the sword holder: There are two holes on the holder back where the nails fit in once you put the screws in the wall. The mount is easy to install, please contact us if you have any questions relating to this item. Chinese vintage hollow out pattern, decent samurai sword display wall mount. Material: Wood; Color: All black. Sturdy and decent to hold a basic samurai sword. Size: 14.5inch / 37cm in length; Two display mode in different height: 32 cm(12.6 inch) / 34cm(13.4inch). Please see specific data in image. 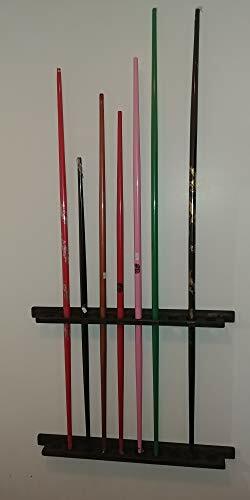 Sword Holder Display for samurai swords such as Katana, Wakizashi, Genji, etc. 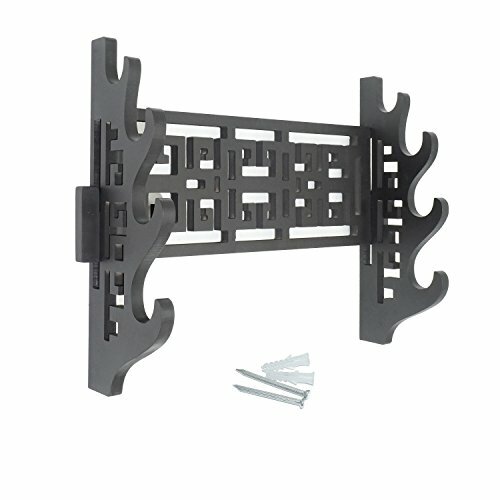 Package: Four-Layer sword holder including mounting hardware. EASY to assemble. Well Packaged. A decent gift. Single Sword Stand is designed to display your sword horizontally on tabletop. It is constructed of hard wood with a solid black finish. It fits one Japanese Katana, Wakisazhi or Tanto. This is an essential piece for any sword collector. The assembly is simply and only takes seconds to complete. 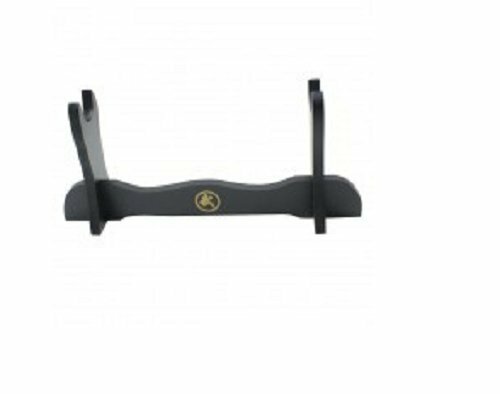 Display a complete sword collection with one of these elegant 8-tier floor or table top sword stands. Constructed of high quality compressed wood with a black lacquered finish. Ideal for Katana. Displays 8 swords in a horizontal position. 49 inches overall. Chinese dragon is a deified animal worshiped in Chinese myths and legends. It is commonly used to represent auspicious, and one of the most representative of the Chinese nation's traditional culture. This holder designed in Chinese dragon shape wishes a good fortune in the future. Made from high density board of resin and solid wood. Delicate design and fine workmanship. Suitable for holding item that is 30cm to 60cm long. A good holder for sword, knife, flute etc. Could be used as a great decoration at home. 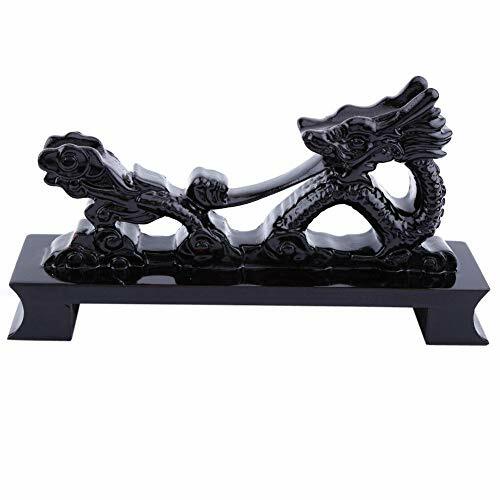 Size: 21.6cm x 5.6cm x 11.7cm / 8.5" x 2.2" x 4.6"
Chinese dragon is a deified animal worshiped in Chinese myths and legends. This holder designed in Chinese dragon shape wishes a good fortune in the future. This Sword stand made of high density board of resin and solid wood, lightweight,very good display of your sword. Dimension: 21.6cm x 5.6cm x 11.7cm / 8.5 x 2.2 x 4.6,Suitable for holding item that is 30cm to 60cm long. A good holder for sword, knife, flute etc. Could be used as a great decoration at home. Instructions: Install the Top brace: Press two wooden wedges into the holes on either side. Use pegs to secure the top piece. Install the bottom bar: Put the mounted screws through the holes and use nuts to secure the threaded bolts on the bottom cross-piece. Hang the sword holder: There are two holes in the holder back where the nails fit in once you put the screws in the wall. 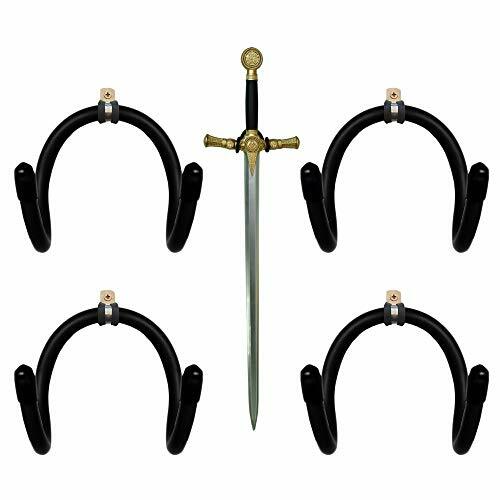 Specifications: Color: All balck, a great decoration for swords. Material: Density wood. 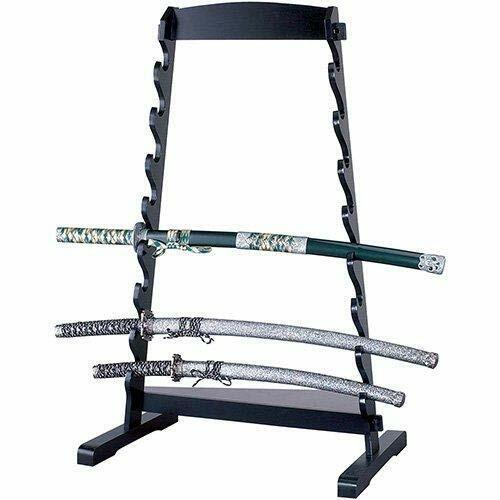 Size: 13.8 x 22.8 inch / 35 * 58 cm Sturdy enough to hold 5 common samurai swords Five layer Package Included: 1x Sword holder 2x Nails 2x Wall anchor plugs 2x Pegs 2x Nuts 1x Small spanner Please feel free to contact KingSo after-sales directly if you have any questions or suggestions. 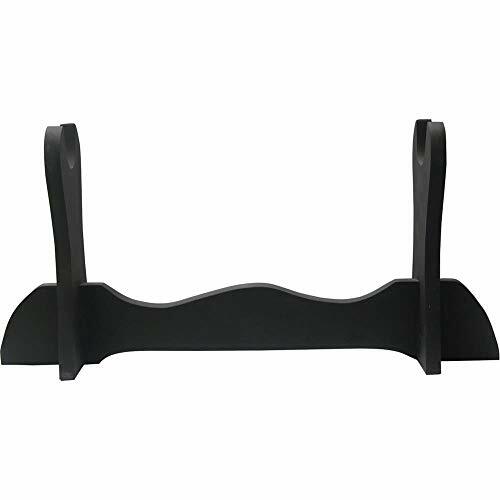 Decent and sturdy wall mount stand rack for your swords display. 5 layers sword wall mount. Smooth and exquisite surface. Two holes in the back to firmly support it on the wall. Very sturdy once you placed it on the wall. 5-tier size: 13.8 x 22.8 inch / 1.38inch notch to hold the sword. Please see specific in the listing picture. Black Stained Wood. Holds 10 Staffs.Mounts on Wall BO STAFFS NOT INCLUDED. 3lbs . 31" x 6" x 3"